It’s election time again for your member organization. Only one name appears on the ballot next to each open position and they’re the same names that have appeared for many years. Sound familiar? 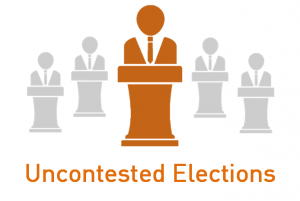 There are many downsides to uncontested elections, but the consequences can reach far beyond just reinforcing the status quo. When your organization’s members see the same name up for the same position year after year with no competition, they’re much less likely to vote. After all, why take the time to cast a ballot if the outcome is going to be the same regardless of their participation? When members don’t have a slate of candidates (or at least two people) from which to choose, they’re less likely to feel your organization adequately represents their needs. Not only will they be less inclined to vote, they may decrease their involvement with an organization that seems perpetually stuck in the same gear and unlikely (or unwilling) to innovate. Sure your current board or elected officials might agree to stay on for many years, but is that really what your organization wants and needs? New candidates can bring with them fresh ideas and energy. Healthy, strategic board turnover should be encouraged. The democratic process is designed to empower your members and a constant slate of uncontested elections circumvents that process. Voters may become less engaged due to lack of choice. Or their unwillingness to vote may also be a message that they’re fed up with the sole candidate on offer. Holding uncontested elections year after year isn’t a good trend for member organizations or the members you’re relying on to cast their ballots. A great way to buck this trend is to move toward a process that simplifies nominations for your members and organization. Our new DirectNominations platform brings the process to the web, which increases the speed and efficiency of your nominations, while reducing staff time and postage costs. If you have a question about your organization’s uncontested election or how to increase voter participation, let us know. We’re here to help. Previous Previous post: Why Your Members Aren’t Voting – We’re Giving You the FREE eBook!